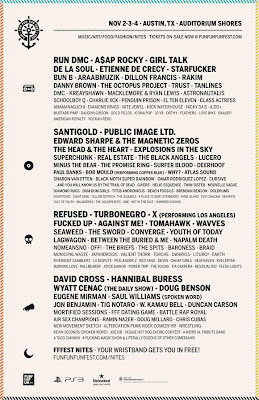 You probably know by now that the official Fun Fun Fun Fest line-up was revealed last night. There has already been lots of discussion, some people expressing disappointment others expressing excitement. 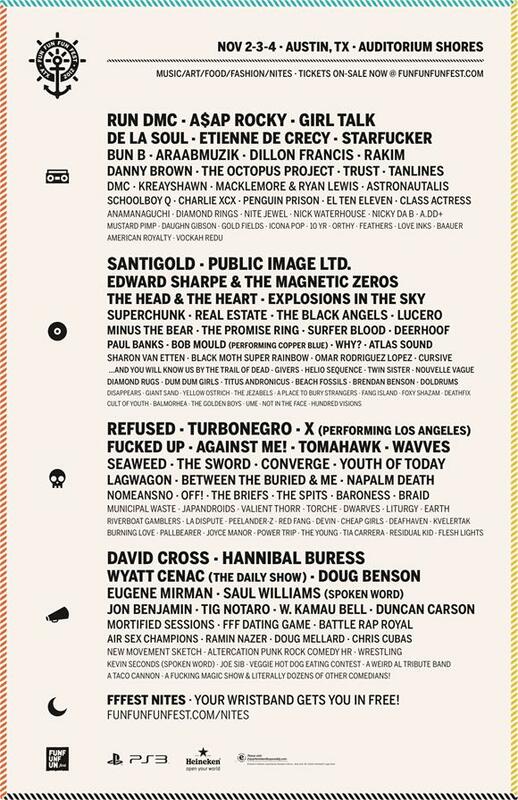 Personally, I have never been disappointed in a Fun Fun Fun Fest line-up and this year is certainly no exception. I will concede that last year had more well-known bands on the Orange stage but I feel like this year embraces the adventurous spirit of festivals past. The thing that makes Fun Fest different from every other festival is its genre-hopping and its ear-to-the-street booking. You may not be excited about American Royalty at the moment but in a year and half when they've blown-up you will have already seen them. It is with that spirit that I wanted to highlight some of the artists who I'm most excited to see. You can find the Bloggy-favs after the break. Ok, so now for the Bloggy-favs. I will say that I am not a Black stage person. I have nothing against the bands on those stage nor the people who enjoy them, it's just never really been my thing. I will venture over there for Japandroids for sure, other than that maybe I'll check out Off!, X, Flesh Lights, The Young? Maybe I won't it sort of depends on the timing. If you want in on all of this fun you better get yourself a ticket and if you can spare the cash, PIP is definitely the way to go.